The story of John Lennon's childhood and teenage years from 1944 to 1960, his relationship with his aunt Mimi and his mother Julia -the two dominant women in the first part of his life-, his first meeting with Paul McCartney and George Harrison, their friendship, their love for music and the birth of The Beatles. Taglines: The Extraordinary Untold Story Of John Lennon. In this film David Threlfall plays Anne-Marie Duff's brother-in-law. In the series Shameless he played her father. Continuity: When offering a cheek to kiss on John and Julia's first outing she offers her left cheek when the camera is behind John but when the camera switches to a side view she is offering her right. Upon reading other comments, this film clearly polarizes viewers. I suggest you read the comment by someone called Phantom Fan who sums up a lot of the story and emotional content quite well in my opinion. As a result I need not repeat. I am old enough to remember the Beatles in their climb to fame, but this film is not about that. 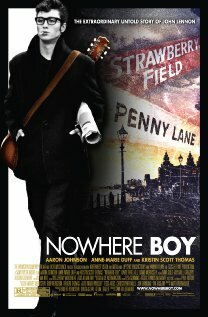 The film is about John Lennon at 15. This seems to annoy some viewers. If a person reads the ads and sees the trailer: it clearly says JOHN LENNON AT 15. So whining about the film not being about John Lennon at 25 and not being about The Beatles seems as though someone did not pay attention to the film's advertising information. 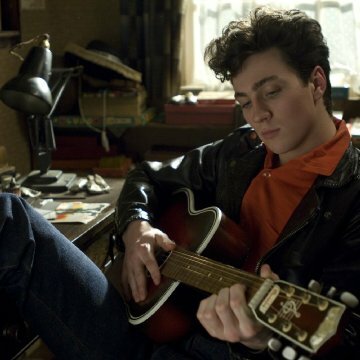 What we do have however is a superb production set in the mid 1950s as rock n roll grabbed teens and John Lennon (aged 15) realized some emotional hard truths about his family and himself. It just these key emotional Lennon family earthquakes that is the story of this film. Not 'How The Beatles met". The tug of love between two brittle sisters and the increasingly shocked and troubled Lennon let us glimpse the deep ruptures in his romantic psyche that saw his scorching opinions and acidic wit build. This is a great film, the art direction and set design allow the viewer to feel as though they are there in those rooms on those days. Aaron Johnson is possibly too handsome for John and is photographed to boost his genuine beauty; the photography and the direction are terrific. Interesting for Australian cinema goers is that we are fortunate to have had two award winning films previously about similar family backgrounds: CAREFUL HE MIGHT HEAR YOU from 1983 written as a memoir by Sumner Locke Elliott about his life at 6 years old being bounced between two warring aunts and an absent father is almost identical family (flashbacks) background to NOWHERE BOY. Also Eric Bana's 2008 film with Kobi Smit McPhee called ROMULUS MY FATHER is almost a flip-side between a Dad trying to save his son from an unstable mother and her lovers. So perhaps we in Oz are better more willing to applaud NOWHERE BOY on this basis. 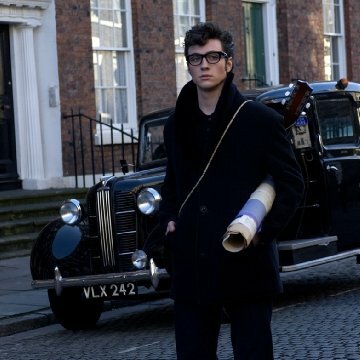 I found every part of this film compelling and thought Johnson great casting for young Lennon. The two sisters and their unraveling personal issues from their fraught past made excellent drama. I went with it all and I suggest you do too. But be prepared to let it inform you rather than you demand 'a Beatles movie'. My only niggle is the fey depiction of a 15 year old cherubic sissy styled Paul McCartney. 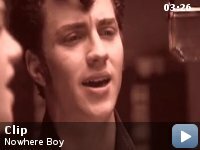 NOWHERE BOY went somewhere for me.